Images are a key content on your website? If you’re serious about your website performance, you have probably optimized them. But have you considered to lazy load your images? Lazy loading images improves the user experience by saving bandwidth for important content first. Some reject the technique for SEO considerations. But properly lazy loading your images does not prevent them from being indexed. Let’s find out why you should implement lazy load, and how to make sure you build it in a SEO friendly way. Note: this post first appeared in Lazy Loading, faster webpages, SEO friendly. Images are everywhere on the Web. Serving the right image in the right context can be really challenging. Images need to be optimized, adapted to its rendering area, and only loaded if required. Images Lazy Loading is a set of techniques designed to answer this last requirement. An image will be loaded only if it is useful for the visitor: the download of an image is triggered when it’s needed: after a specific interaction, as a result of a scroll… or never. 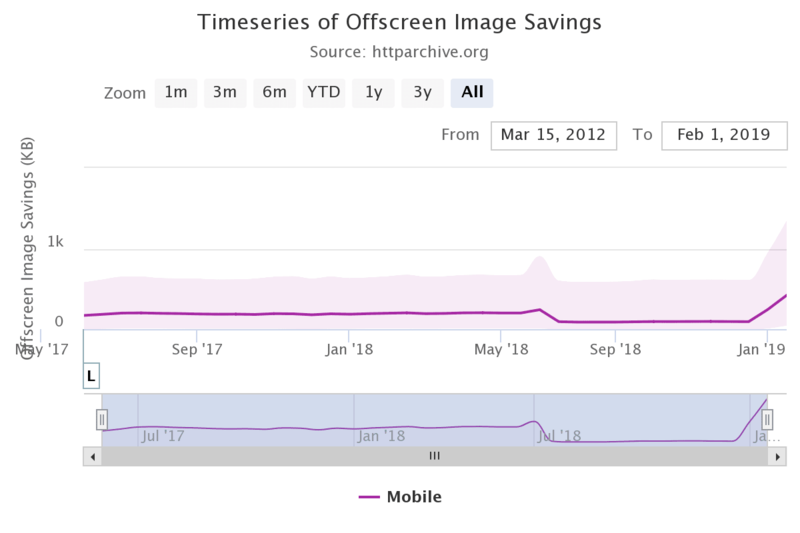 According to HTTPArchive,420 KB (median value) could be saved per page by lazy-loading offscreen and hidden images. There are many concrete cases where Lazy Loading is involved. Let us take a few minutes to cite a few examples. E-Commerce Search Results. These pages often contain so many results that a lot of products are outside the viewport. Is it useful to download their images? With Lazy Loading, you can delay their loading until the page is scrolled. Carousels. You know about them, right? Why should the user load all of the images whereas it will only showcase the first one during several seconds… Lazy load them! Load the first one, and trigger the download of the next when in the background a couple of seconds before the carousel animation. Menus and tabs. Images contained in a menu or a tab are often hidden, only displayed after a click. With Lazy Loading, you can delay the loading of the images until the button displaying the element is hovered or clicked. Depending on the nature of your page, other cases are possible. No images should be included on your pages without previously asking yourself the question of delaying their download. Because at the end of the day, there are significant performance gains. By postponing the loading of images that are not immediately required – or, in some cases, not loading them at all – the browser saves resources (bandwidth as well as CPU). The page loads faster and the user experience is improved as saved resources can be affected to more critical content. There are also server-side gains. The CPU and bandwidth required to delivered the resources are subjected to less stress, reducing the hosting and/or CDN costs. As said in the introduction, Lazy Loading do not prevent your images from being indexed by search engines. But it can be tricky and all the techniques are not equals, as all the best practices are not implemented by the various libraries and plugins available on the market. To preserve your organic SEO, you need to understand how Lazy Loading works, and how to use it safely. You don’t need to – and shouldn’t – lazy load all your images. If you know that some images will be displayed most of the time , let them be loaded and rendered normally. Lazy Loading is only recommended for the other images. Do not add complexity when it’s not required! The most traditional solution consists of using JS to reassess, at regular intervals and for each image (or each element displaying an image as a background), if it needs to be loaded. High-performance libraries such as lazysizes are built on this paradigm and are compatible with older browsers. lazysizes can even detect if the User-Agent is able to scroll and, if not, load the images right away. However, running those tests so regularly has a cost. This cost can be avoided for web browsers supporting the Intersection and Mutation Observer APIs (that provide the ability to react to specific DOM situations rather than having to test continuously). yall.js and lozad.js are good examples of this condition-based technique (they are only compatible with modern browsers, but you can use a polyfill to emulate the missing feature for older browsers). The library identifies its target images through an attribute, quite often using a specific class (for example, here, we are using the js-lazyload class). When the library detects it’s time to load the image, the data-src attribute is used to populate the src attribute and the browser starts loading the image. The technique is the same for other media types (video, iframes) or images adapted for responsive web design (for example, the data-srcset attribute can be used to temporarily retain the final value of the srcset attribute). alt="A spacious garden dominated by a large pine tree." You may be afraid of the resulting verbose HTML related to code duplication. Don’t worry, your HTML documents have to be compressed with gzip or brotli before being sent on the network, hence a marginal impact in transfer size (if you’re not sure you’re website is properly using compression, audit your pages on Dareboost). Of course, it remains true that entering all these tags is tedious. 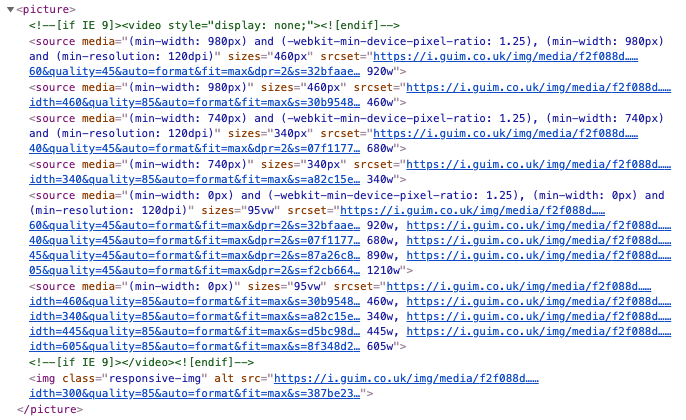 When managing responsive images, artistic direction… the markup of images can be very, very complex. So anyway, you should not enter this HTML code manually: dealing automatically with this kind of complexity should be the work of your CMS or a task of your contribution workflow whatever it is. Once you’ve implemented Lazy Loading, you’ll need to test that it works. The simplest solution is, of course to run a full web performance diagnosis with Dareboost to detect if all the images outside of the viewport are lazyloaded. If it’s not the case, we’ll tell you and give you the URLs of the images for which loading can be postponed. If you have conditioned the loading of your images to a browser or a custom event, feel free to use your report’s Waterfall to check that the loading of images follows the correct sequence. In the case of a custom event, feel free to also use a Custom Timing: you’ll be able to find the event in the Waterfall. It may also need to do manual tests. Open your browser on the concerned webpage, open the Developper Tools and select the Network tab (every modern browser features it). Empty the network stack to better visualize new calls, then provoke the interaction meant to start the lazy loading. You may consider automating these tests by using browser-based tools to perform tests. Puppeteer is one of them and can be used to test the behavior of your lazy loading on Chrome or Chromium, to make sure that your real users will see your images. To verify that crawler bots will also see your images, you can ask Google itself, using the URL Inspector tool of the Google Search Console. You will view your page exactly as fetch by Google. Just insert your URL for Googlebot to test your page and screenshot the result to confirm that your <noscript> fallback is working. Here we are, you now know everything there is to know about Images Lazy Load, its SEO impact and the best way to get around it. Let’s trim some pages!